Building a carport footing is no simple task if you are going at it blindly. There are several different stages that are necessary for a successful job. It can be done by a beginner, however, but he must follow a few steps in order to complete the job successfully. Lay out and mark the area of construction. Using the 2 by 4 boards, cut them into 2-foot pieces with a sharp point on one end. Start on one corner of the desired location and drive the stake into the ground. Stretch a tape measure from the first point (A) and over to the second point(B) and drive another stake into the ground. Continue all the way around until you have all four corners of the footing footprint. This will represent the outer edge of the footing. Square the layout lines by measuring the diagonals of the square. Measure from point A to point C, then measure from B to D. If the two measurements are the same, then the footing is square, if not, then adjust the lines accordingly. Transfer the line to the ground using orange marking paint. Spray a line onto the ground that corresponds with the layout string that you assembled in the above steps. Once the paint is on the ground, remove the stakes and string. You now have a reference line for digging. Measure over 16 to 20 inches off of the outside line and make another line. This will represent the inside of the footer. It need not be perfect because the footer will be below grade and out of sight. Dig the footer 16 inches deep all the way around. Shoot a level point at corner A with the builders level. You may rent a builders level at you local tool rental store. The clerk will instruct you on how to set up the level and use it. Continue all the way around the footer with the level, checking the rest of the footer to make sure it is the same level as point A. The footer may get deeper than 16 inches at some points. Cut the Rebar into 2-foot pieces and drive them into the ground beginning at point A and at every 4 feet from there on. Drive the first pin/rebar down and leave 12 inches above the dirt. Check the level of this pin with the builders level and level the rest of the pins to point A pin. Paint the tops of the pins with the orange paint. This will be your visual points when pouring the concrete. Figure the concrete for the footer. Take the entire length of the footers and multiply them by the width and thickness of the footer. If you have a square layout that is 10 feet long and 10 feet wide, then multiply 10 times 4 and that will give you 40 linear feet of footing. The width is 16 inches of concrete, so that will be 1.5 feet of concrete, and the thickness of concrete is 12 inches or 1 foot. So, the formula would be 40 x 1.5 x 1 = 60. 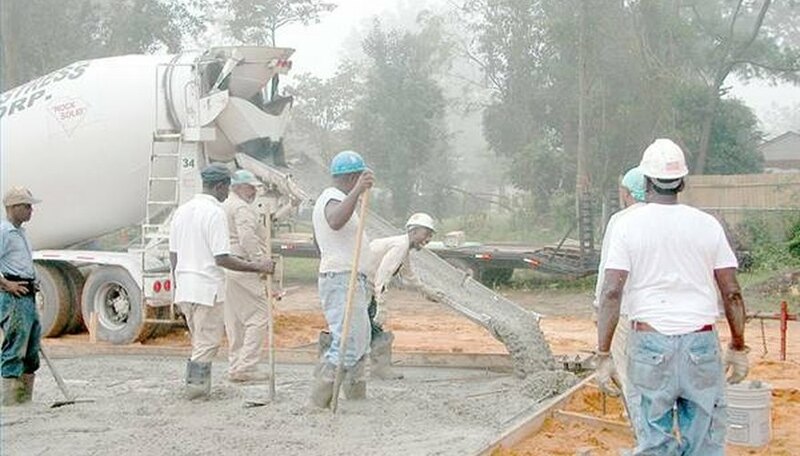 Multiply that number by 27 and you will have the total amount of concrete in cubic yards needed to pour the footing. 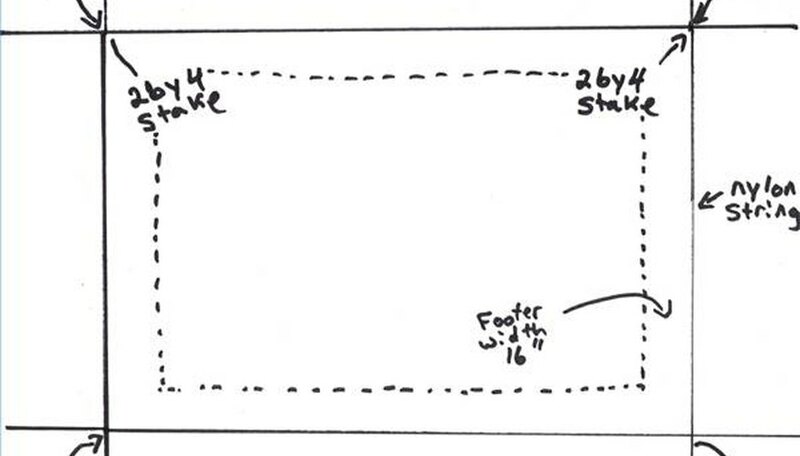 Since 60 divided by 27 is 2.22, you would need 2.22 yards of concrete to pour the footers. Lay 2 1/2-inch Rebar side by side inside the footer and set them up on concrete bricks. The bricks are about 4 inches thick, so this would put the Rebar about 4 inches into the concrete pour. The Rebar will strengthen the footing. Pour the concrete to the top of the orange painted Rebar pins. Level the concrete out around the footer and allow the footer to cure for three to five days before putting weight on them. You may also level the pins and digging with a 4- or 6-foot carpenter's level.